Pastor Jeff Manion weaves masterful contemporary storytelling with rich biblical, historical, and cultural background, revealing the similarities between the struggles of today’s culture with that of the New Testament churches. 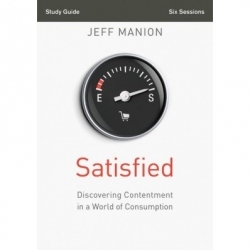 Satisfied explores the way in which the messages to the New Testament churches were received by the original readers and how these passages can alter the way we view wealth, accumulation, and ultimate contentment today. Designed for use with the Satisfied DVD (sold separately).